Nov. 9, 2017 6:00 a.m. Seven men who rescued a family from a burning SUV in August were honoured for their bravery on Tuesday night at Pitt Meadows city hall. 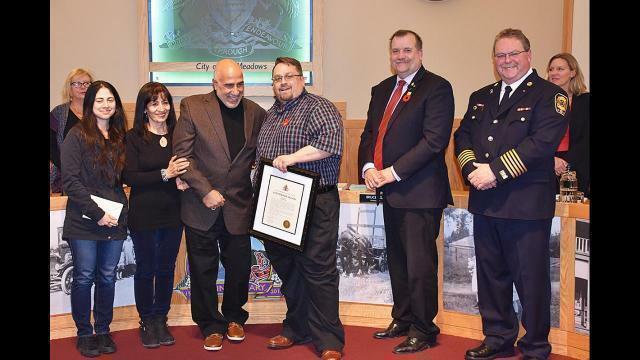 Fire Chief Don Jolley and Mayor John Becker presented Mark Armbrust, Byron Meston, David Craik, Brett Danggas, Aaron Davis, David Law and a seventh man who wished to remain anonymous with the Civilian Citation for Valour, in front of a packed city council chambers. There to thank them were Maple Ridge couple Fereshteh Sabet and Mehrdad Mirza-agha, with their 26-year-old daughter Melody. The trio had been pulled from the burning vehicle, along with their two nephews, aged six and eight, who had been visiting from Winnipeg. Melody expressed the family’s thanks, wiping tears from her cheeks. “It would not do you justice to call your actions kind or brave. The heroism you displayed was unlike anything we have ever witnessed or experienced. If it wasn’t for you acting together as you did, as quickly as you did, we would not be alive. “Although we were suddenly thrown into chaos and horror, we can still remember the relief that washed over us when we heard your voices outside of our burning vehicle. “We cannot stress how precious your presence was, and how perfect your timing was that night. We cannot thank you deeply enough for giving our family another chance to be together on this earth. On Aug. 12 at about 10:30 p.m., Mirza-agha suffered a cardiac arrest. He went unconscious while driving eastbound near Meadowtown Centre. The out-of-control vehicle crossed several lanes of traffic, then hit a large metal transmission pole in front of Boston Pizza. The Hyundai Santa Fe flipped onto its side and burst into flames, with the family trapped inside. Those involved recalled the events of that night while standing outside city hall holding their awards, and at an informal meeting at the firehall, after the ceremony. Danggas said the men did not hesitate to approach the burning SUV. Armbrust was one of the first to the truck, while his daughter Emily called 9-1-1. “Someone asked about a fire extinguisher and it was like, ‘We don’t have time. We’ve got to get them out of there,” he remembered. Armbrust tried to lift the vehicle by himself, to flip it on its side, and was quickly joined by three or four others. They couldn’t manage, but then more people joined the effort. Aaron Davis and his wife Karen were just returning from a wedding when they came upon the scene. “We ran up to the car with everybody else. It was sitting on its side and it was already on fire in the front, and we just started heaving it, to try and get it up on its wheels. Nobody could get out otherwise,” said Davis. Six or seven people rocked the truck four times, and actually succeeded in lifting it onto a lane divider. They pulled Sabet out of the passenger side door. She was conscious but had suffered severe injuries. They opened the rear hatch and helped get the boys and Melody out. They were all in a state of shock. The crumpled driver’s side door wouldn’t open, and Mirza-agha was unconscious behind the wheel. Armbrust tried to pull him through the passenger’s side, but he was dead weight, and somehow caught in the wreckage. The men determined that the door had to come off. Dangass is a former power lifter, who could once bench 300 pounds, and helped virtually rip the door off the SUV without the benefit of any tools. Meston saw fire coming through the dash as they tried to free the unconscious man from the wreckage, but his legs were still caught. “Someone said ‘life or limb,’ and we pulled with all our might,” Meston recalled. “The leg is still there,” laughed Mirza-agha. Once they got him out, Meston said there was no response from the victim, and no eye movement. They started CPR on the spot. “The car was fully involved and the fire was creeping up. The heat on our backs was intense and we had to grab you and move you another 20 feet,” said Meston. They gave him a chance, and paramedics took over as firefighters extinguished the burning SUV. Mirza-agha said he stopped breathing for so long that doctors prepared his family that if he recovered, he might have severe brain damage. But he was able to walk to the event, and hug the people who saved him and his family, and laugh with them afterward. He and his wife have had long and challenging recoveries. The men said they did not feel like heroes. Davis said he did not want recognition, or think it necessary, but the events of that night changed the way he sees his fellow man. The reunion of the people who experienced that night was a great experience. Jolley said it is the first time in his nine years as fire chief that the award has been presented, so it is a rare honour. “It doesn’t happen often where individuals have that much of an impact at a scene. It’s humbling to see the actions of others that have such a positive impact,” said Jolley. He said vehicles don’t usually explode in Hollywood fireballs, but there can be sudden flare-up. Those honoured put their lives at risk. There were no professional emergency responders in the group, but they did what had to be done. “They did absolutely everything right. This family is alive because of what they did. They couldn’t have done anything better,” said the fire chief. Sabet does not like to think about that night, but she expressed her thanks. Mirza-agha echoed his wife’s sentiments. “The love they showed was incredible. They risked their lives to save our lives. If it was not for them, I would not be here, with my family. There is the deepest gratitude on our part. We praise the god that put those people with us at the time of the accident.